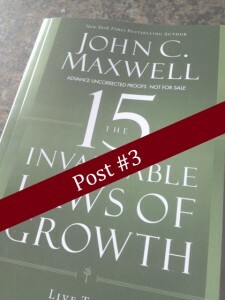 This is part three of a series on John C. Maxwell’s The 15 Invaluable Laws of Growth that will be out in October 2012. If you haven’t read the previous posts, you can find Part One here and Part Two here. At this point I’ve read through chapter seven, and the theme that is resonating the most with me is this: get started now. This cord runs through the chapters, beginning in chapter two, “The Law of Awareness” where Maxwell encourages his readers to get started even when they think they aren’t ready. He gives several examples from his own life of when he made commitments to do something before he was ready because he knew this would get him to where he needed to be. The initial part of this theme reminds me of advice I was once given by a mentor. I was trying to grow in my career and seeking a promotion. She had me write out everything I hoped to do and be in the role I wanted. Then she said a very simple thing. “Start doing those things, now.” It was incredibly simple and profound all the same. To achieve the role I desired, I just needed to take on the responsibility I wanted. So, get started & get started now. Waiting for “the right time” or “when you’re ready” will never come. And (I, not Maxwell) will say that it doesn’t matter that you’re not perfect all at once. (Maxwell sets the standard high: the goal is daily discipline.) With reading this book, I haven’t kept the pace I started, but I have kept on. And, while it isn’t every day, several times a week I’m going back and continuing working through the exercises Maxwell gives for developing the laws he’s advocating.